According to Benedict Anderson, a nation is “an imagined political community [that is] imagined as both inherently limited and sovereign.” That is arguably Anderson’s most famous quote, the essence of which I can hardly forget given the best efforts of Dr Pat Goon back during my Monash days. I had slaved long hours trying to understand it, poke it with criticisms, lunge wild right hooks at it, but it stands and stays with me for two other reasons. One: Benedict Anderson is not dead. Still isn’t. Lecturing at a university somewhere, apparently. I say that because 99% of the theories that you learn at Monash are theories of dead people. Not that it makes it necessarily wrong, but some of them, had they been alive today, might feel inclined to slightly modify their earlier theses on society (I’m looking at you, spirit of Mr Barthes). The second is that the statement, to the best of my experiences, is rather true. More specifically, the idea behind the statement is truer than most truths I’ve come across. It certainly magnifies itself further when you’re in a different country, and outside of the mainstream. You don’t eat the food, don’t speak the language, don’t understand the culture. Being a part of the minority brings the notion of your nationhood, that imagined community, into sharp focus. 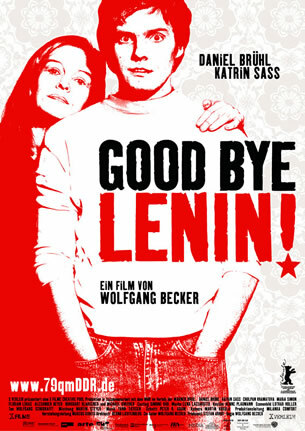 Or you can just save yourself the trouble and watch Wolfgang Becker’s ‘Goodbye Lenin’ bring that into sharper focus. This concept of imagined community literally played itself out in late 80s East Germany, around the time when the Berlin wall fell. Upon seeing her son Alex (Daniel Bruhl) arrested by the state police, Christiane (Katrin Sass) got a heart attack and fell into a coma. She remains in this state for almost year, during which the German Democratic Republic (GDR, or East Germany) almost literally collapsed. 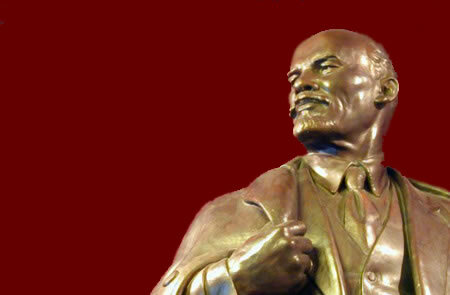 People moved to the richer West, while Western influences like Coca Cola made their presence known in the East. So when Christiane unexpectedly wakes up from her coma, the country that she knew and loved was no more. Complicating matters, such was her fragile state that doctors told Alex and his sister, Ariane (Maria Simon), that any shocks to the system would likely be fatal to their mother. Setting the wheels in motion in his head, Alex takes his mother out of hospital to care for her at home (where she is bed-bound). Here, he would recreate the country that she had so loved, in the hope that it would keep his mother alive. The attention Alex pays to the details in recreating the GDR mirrors the meticulousness with which Becker constructs the film. 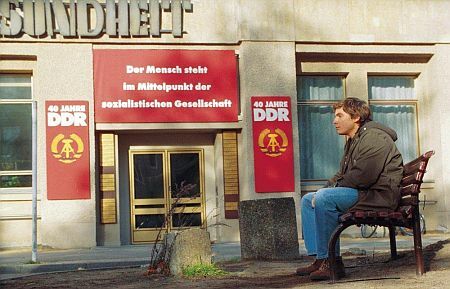 The movie itself started before the fall of the wall, with a flashbacks to Alex’s childhood, when his father left them to defect to the West (it was this that drove Christiane to give all of herself to her children and the GDR, believing that they wouldn’t fail her). In telling this story credibly, Becker manages to portray what life was like behind the Iron Curtain, if only momentarily. Though the screen time was short, it was important as it allows us to better contrast the changes that comes later. 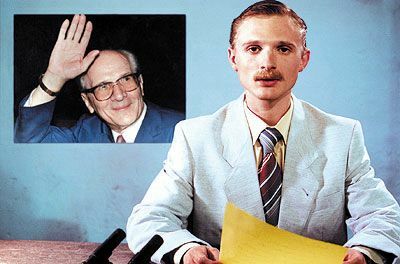 Even a seemingly minute detail on the news, like the announcement of the East German astronaut Sigmund Jahn (Stefan Walz) would become an important cog in the machine later on. Just as he is able to show life before the Berlin wall fell, he is able to create a sense of loss afterwards as well. I say ‘a’, rather than ‘the’, as ‘the’ would imply the loss that the citizens would have felt after the fall. The changing of the guards in England, for example, is still able to attract a sizeable tourist crowd. In East Germany, the scene showing public apathy at the same thing may have been short, but it most certainly wasn’t sweet. If anything, we gain an insight into what Christiane would have felt. Another small, yet significant part of the story centred on one of his mother’s love for a brand of pickles. It’s not just any pickles; no, it’s the East German product. Of course, such was the rate of expansion that nobody wants to eat them anymore. And not everything is from the big, bad West. “Where are these from?” asked Alex at the supermarket, looking at the new bottle of pickles. “Holland,” replied the store worker. It made me consider how self sufficient East Germany could have been, if even their neighbouring products are banned. The divide in the film is not just between nations and ideals, but also between reality and fantasy (in case you haven’t noticed). Even the fantasy, in reality, is rooted in reality (wow, that sounds confusing). Alex had to recreate the East Germany that no longer is, but despite it being less than a year, putting things back as they were becomes troublesome. The country has moved forward so fast in embracing the Western culture that even cars and clothes are swiftly adopted and adapted. Forgive Fikri for his enthusiasm. He waited five years to watch the movie. I saw him in a brilliant German movie, The Edukators. He’s the guy in Ladies in Lavender as well right? This sounds like an interesting film. He was in ‘The Bourne Ultimatum’ as well, if you watched closely. 🙂 I haven’t seen the other two movies you mentioned, but they’ll have some way to go to match ‘Lenin’.